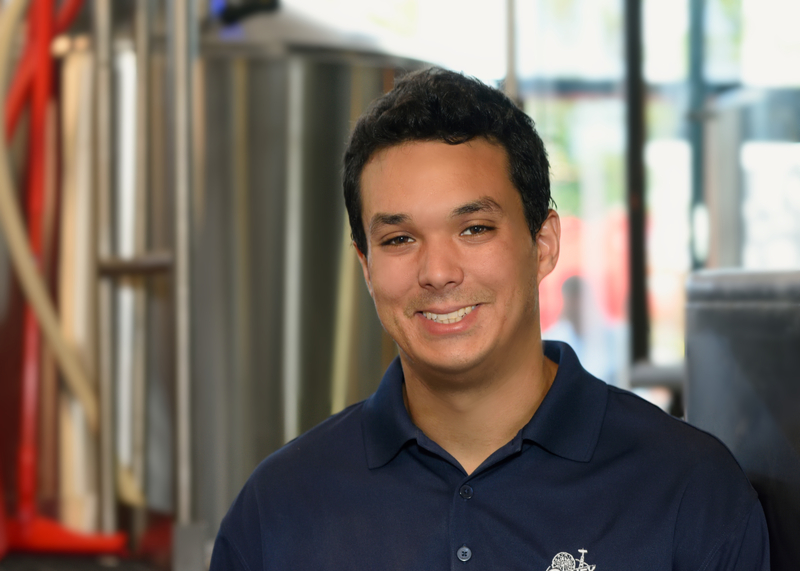 Concrete Beach Brewing in Wynwood welcomed their newest brewmaster, Eric Hernandez, a few months ago. This former Biology major and homebrewer cut his teeth at Concrete Beach’s sister breweries in LA and NY, eventually becoming head brewer at Coney Island Brewing. I spoke to Eric about his time in LA, moving to Miami, and rooftop gardening. When did you first discover craft beer? What was the beer that really opened your eyes to brewing? I first started getting into craft beer my senior year of college. I remember that I heard about Midas Touch, a beer from Dogfish Head, and about how they copied a recipe from an ancient ale. I really enjoyed the story behind it. I went to find it, tried it, and it’s all been craft since then. I started brewing at home about 8 years ago, and I’ve been brewing professionally for almost 5 years. Our signature beer is definitely our Stiltsville Pilsner. It is a beer that really represents what we are about both as a style and in name. It is named after that crazy time in the 40s and 50s where parties would go on all night on the ocean in Stiltsville. As a bright, hoppy Pilsner, it is not traditional to style, but really creates its own niche in the brewing culture of Miami. A lot like the same way I got into brewing in the first place. Being in the right place at the right time with a little bit of luck. I have brewed in Los Angeles and New York City, but when I was offered the opportunity to join the Concrete Beach team, it was an offer I couldn’t refuse. The brewery is absolutely gorgeous, and a literal brewer’s playground. Being located in Wynwood, we are surrounded by a new, up and coming experience that is really complemented by the growing Miami and South Florida brewing scene. I always try to initially draw from the cultures and history of the area that I am brewing. When people see their culture represented accurately in a brew or a name, it really adds to their experience when they are drinking the beer. There are days where I go back to classic styles and names, but I always try to give it a personal twist. Luckily, Miami has no shortage of inspiration to draw from, both with its rich history and intermingled cultures. When people initially think of Miami, they think of the sun and the beach. Well contrary to that, there is so much more going on in Miami than the beach. Most of the best things in the city are just a little inland, and where we are in Wynwood is no exception. Surrounded by concrete (not to mention rapid construction) and beautiful art throughout the streets, it’s a bit of a challenge to those that assume Miami is all about the beach. It is an extremely rewarding job. Being able to bring your ideas to life and have customers come to enjoy those ideas is something truly special. However, it is a hard, dirty job. If you don’t mind endless cleaning, lifting and have a true passion for beer, it is definitely the right path for you. It’s not always easy to break into either, I know especially. The right opportunity will come to those who go for it. Absolutely not! Actually I only see it growing. Coming from cities that have larger craft brewing presence, I only see great things for the Florida craft brewing scene. Florida is creating some great breweries and beers, and I can’t wait to see what the future has in store for it. You are now the third head brewer at Concrete Beach. How difficult is it to brew styles that other brewers developed, while still making your own mark? Not difficult at all! The recipes are set and we have constant quality evaluations in place to make sure they continue to taste the way they are supposed to. Every brewer has their own way, and I still get the opportunity to create and put my stamp on new brews. One of my favorite parts of your sister brewery Angel City Brewing is the rooftop fruit and hop garden. Any possibility of replicating that here in Miami? I wish! But no … unfortunately, to do that, we would need to put in a new roof! Other than culture and history, what differences did you find interesting about brewing in Miami rather than elsewhere you’ve brewed? I didn’t realize that there would be such a robust craft beer community in Miami. They have been such a welcoming group! What ingredients and styles are you most interested in getting into in South Florida? I would love to get into more Belgians and do some barrel aging in a non-traditional way – maybe with tequila or rum barrels. The weather here makes it a little harder to barrel-age, but I’d love to experiment and see what we can come up with.